Pip returns to De Montfort Fine Art! 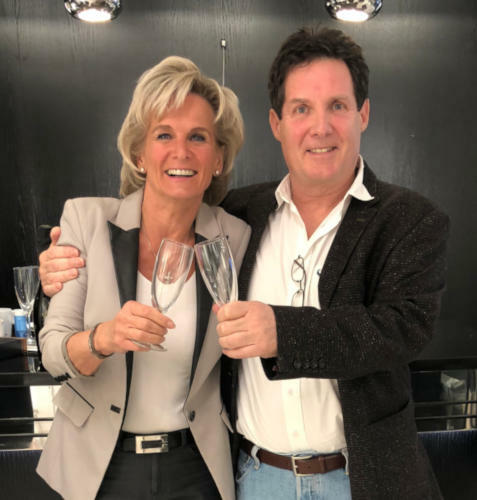 In September 2018, Pip met with Helen Swaby, the renowned founder, owner and CEO of De Montfort Fine Art, and with Director Sara Hill to discuss working together again. De Montfort are now one of the world’s largest and most successful fine art publishers, owning over fifty galleries in the UK alone. Their luxurious Whitewall Galleries can be found in cities and towns across the country, but also on Cunard and P&O liners and cruise ships. In addition, their boutique Clarendon Galleries can be visited in many prestigious locations such as Marlow, Chelsea, Richmond and Cobham. Pip’s work is being launched by De Montfort on 24th January 2019 at their flagship Clarendon Gallery in Mayfair. For further details contact Lucy Riley at De Montfort Fine Art (LucyRiley@demontfortfineart.co.uk). 'Artist In Residence' at Marwell for 20 years – a world record? This January, Pip has been the official ‘Artist in Residence’ at Marwell Zoological Park in Hampshire for over twenty years! In this role, he founded and ran the famous ‘Marwell International Wildlife Art Society’, for sixteen years, during which time it became Europe’s largest wildlife art society, with over three hundred members and many successful exhibitions and fund raising events. In 2004, Pip starred in the highly successful seven-part Meridian Television series ‘A Brush With The Wild’. 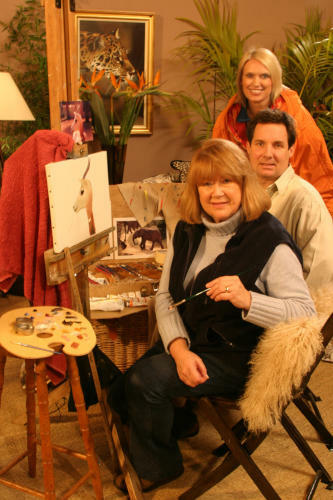 It was presented by Anneka Rice and featured Pip teaching celebrities Nerys Hughes, Christie Hamilton, Linda Robson, Lesley Joseph, Helen Lederer and Jenny Éclair how to paint – it was filmed on location at Marwell and in Kenya. In 2016, Marwell purpose-built a gallery in their retail outlet to house Pip’s wildlife paintings, which are on sale to park visitors. Pip can be contacted on pip@pipmcgarry.com or by telephone 01264 359291. The permanent ‘Pip McGarry Art Gallery’ at Marwell Zoological Park in Hampshire is now open and can be viewed in Marwell’s amazing retail outlet throughout visiting hours! Pip is one of the world’s leading wildlife artists and Marwell’s offical ‘Artist in Residence’ - a proportion of all sales of his paintings at Marwell go towards their incredible work with endangered species! Contact Marwell on 01962 777407 or email pip@pipmcgarry.com for any further information. Record Sales at The Frame Gallery! Pip’s latest solo exhibition at The Frame brought record sales of over £100,000, with eleven originals sold, multiple prints purchased and commissions taken! A packed to capacity private view, followed by crowds of visitors during the following week, saw Pip’s centre-piece painting 'Care To Join Me' sell for £65,000 and his 30 by 20ins ‘Zebra and Egret’ at £16,000. A great time was had by all! 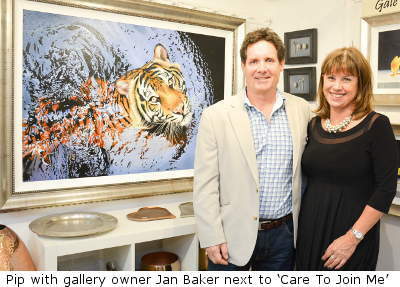 This is the fourth of five solo shows at The Frame Gallery where sales have broken the £100k barrier – massive thanks to gallery owner Jan Baker, Sarah, Sue, Amelia and Chris for all their hard work! !